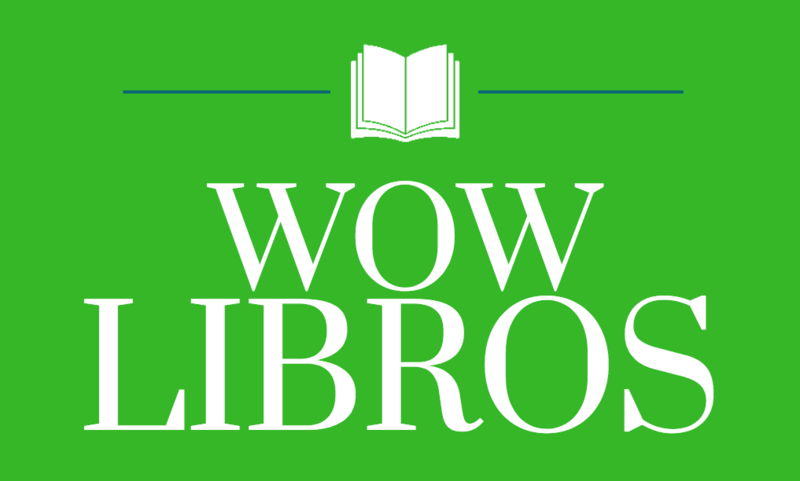 I had the pleasure of interviewing author Monica Brown for my dissertation that focused on small, independent publishing companies that published bilingual books. Monica had just published two books with Luna Rising, which at the time (2005) was a new imprint of Rising Moon, Northland Publishing Company’s children’s book imprint. Luna Rising’s mission was to publish quality children’s books in English and Spanish, so both of Monica’s books were bilingual. The first, My Name is Celia: The Life of Celia Cruz/Me llamo Celia: la vida de Celia Cruz, celebrates the life of Cuban singer Celia Cruz, who became known as the Queen of Salsa. 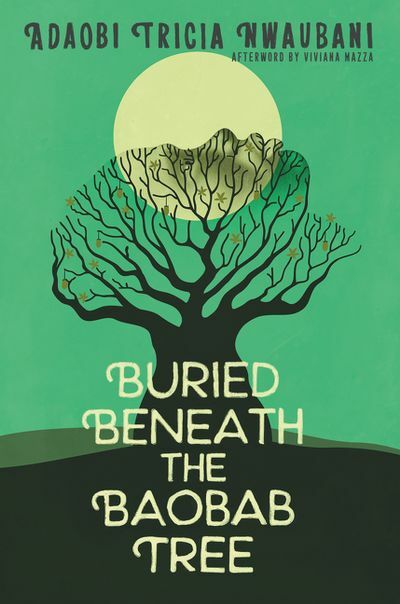 It won the Americas Award for Children’s Literature and was named an Honor Book for Illustration by Pura Belpre. Her second book, My Name is Gabriela, The Life of Gabriela Mistral/Me llamo Gabriela: la vida de Gabriela Mistral, told the story of the first Chilean poet to win the Nobel Peace Prize for Literature. 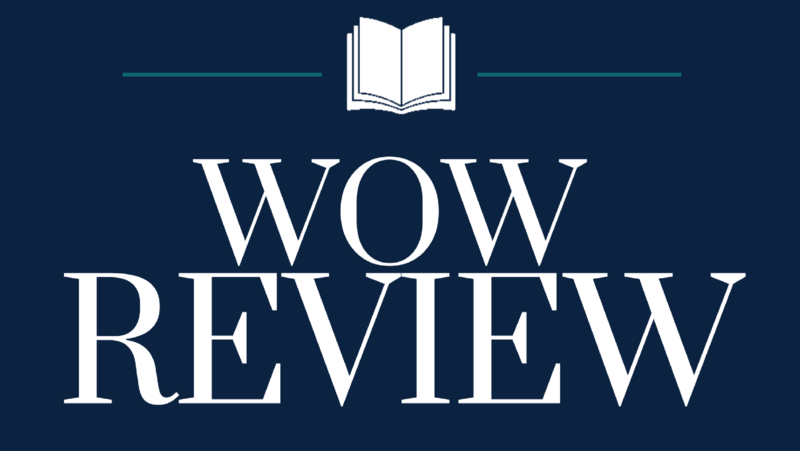 It received starred reviews in both The School Library Journal and Criticas. Now, just seven years later, Monica has published a total of 11 children’s picture books, with several more on the way. All but one of them (Chavela and the Magic Bubble) are bilingual English/Spanish. She added several books to her popular My Name is series with books about the soccer star Pele, author Gabriel Garcia Marquez, and Chilean poet Pablo Neruda; wrote a biography about Cesar Chavez and Dolores Huerta; and published other books that celebrate children’s’ connections to their family and community. 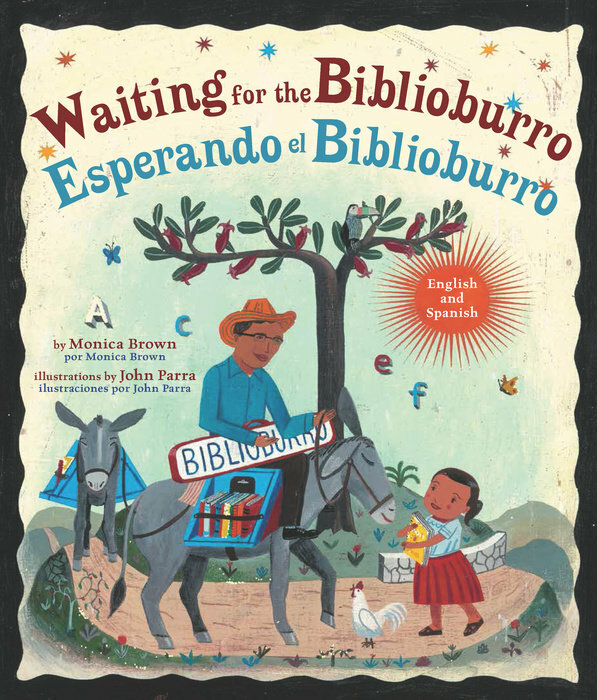 I recently had the opportunity to listen to Monica talk about her latest book, Waiting for the Biblioburro, the true story of a traveling Colombian librarian named Luis Soriano, at the Tucson Festival of Books in May in a presentation with Karen Lynn Williams entitled “Picture Books as Global Passports”. Monica began by explaining that she came from a global family; her mother was from Peru while her father’s family was North American with ties to Europe. She remembers her family being quite fluid, with relatives from Latin America staying with her family in the US and her own experience of living in Peru for several months as a young child. 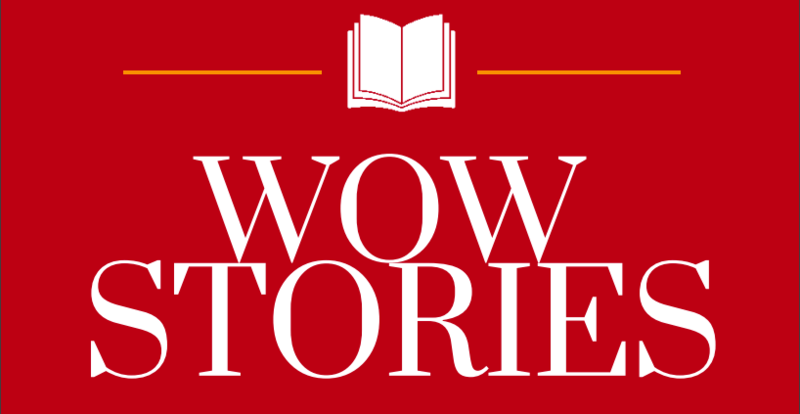 Monica’s mother told her she was a “citizen of the world” and that helped shape her writing. When she had children, she wanted them to know about famous figures in Latin America and to learn about the beauty of Latin American culture. Since she had been teaching Latin American literature for over 10 years, she decided to introduce all children to famous Latin Americans through books. She also realized that, by writing children’s books, she could create fictional worlds that represented her own experiences as well as the diversity of experience in our world. In fact, her newly published book, Marisol McDonald Doesn’t Match/Marisol McDonald no combina, is based on her own experience as a child of many cultures. 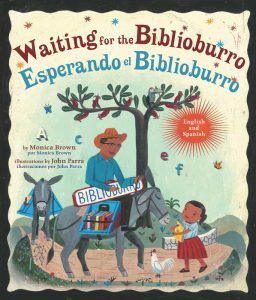 Monica came to write another book, Waiting for the Biblioburro, when she heard the story of Luis Soriano, the founder of the Biblioburro library, a story that certainly captures the imaginations of children and adults alike. A citizen of Colombia, Soriano received a degree in Spanish Literature, and, after becoming a schoolteacher, realized how much power books had in the lives of his students. He knew that many children in remote areas of Colombia had no access to books, so he decided to load up his two burros, Alfa and Beto, with a travelling library to reach children in the more remote parts of the Colombian Caribbean coast. For over ten years, Soriano has been riding his travelling library to more than 4,000 children. Monica said that Luis’s story sparked her imagination because it showed just how far someone would go to read a book. She wrote it from the point of view of Ana, a little girl whose own imagination is set free by the books the biblioburros bring to her distant village. Monica says the story also spoke to her because it contained the themes of finding your voice, of imagination and determination, of social justice and what we can do to spread literacy, and particularly to help children in the US not only appreciate their opportunities but to help them realize that no matter what their personal circumstances are their personal imaginations have no limits. In addition to Monica’s wonderful book about how a young child’s world is transformed by the magic of books, Jeanette Winter, author of The Librarian of Basra, wrote and illustrated a children’s book entitled Biblioburro: A True Story from Colombia, that tells the story of Luis and how he started his famous library. Another book, My Librarian is a Camel: How Books are Brought to Children Around the World, by Margriet Ruurs, celebrates all kinds of ways that books and children are brought together, whether it’s by camel, elephant, or wheelbarrow. These three books make a wonderful reading set to help children learn about children around the world and how books provide a universal human experience. Monica has several more books in the wings, including bibliographies of Tito Puente and Pablo Picasso as well as one called Maya’s Manta, a story about recycling. You can read more about Monica Brown and her wonderful books at her website at http://www.monicabrown.net. You can read more about Luis Soriano and his traveling biblioburro library in an article in the New York Times. Additionally, he has been featured on a PBS special and has been recognized as a CNN hero.